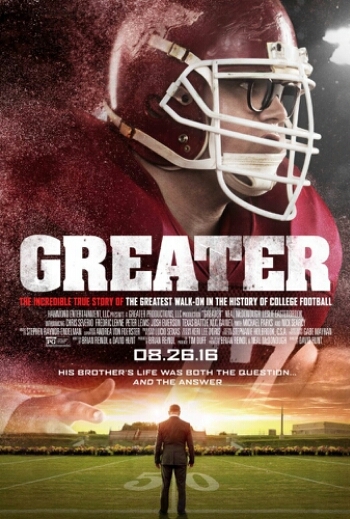 Greater, the story of Brandon Burlsworth, is now out in theaters. It stars Neal McDonough (lately of TV’s Arrow). Brandon had one dream: play for the Arkansas Razorbacks. Problem was he was overweight, slow, and had never played at that level. How did he become the greatest walk-on play in history? That’s the story of Greater, of how Brandon’s grit and determination in the face of derision and overwhelming odds would not be denied. He worked harder, practiced longer, and still gave all the glory to God. Actors wait their entire lives to play a role as meaty and meaningful as Brandon Burlsworth. I was blessed to get that opportunity in my first movie, bringing Brandon to the big screen in GREATER, in theaters everywhere Aug. 26. Dont let anyone tell you that you cant: Brandon was not the most physically gifted athlete. He struggled with being overweight, wasn’t naturally graceful, was a pretty unlikely candidate to be a college football All-American and then drafted into the NFL. He was able to do it all because he refused to listen to those who doubted him or his abilities. He always believed in himself, knew that through hard work and dedication, he could be anything he wanted to be. The only thing standing between you and your dreams is how passionately you’re willing to produce them. Dedicate yourself to something greater: Its no coincidence the film of Brandon’s life is called GREATER. As a Christian, he believed he was called to be a man of integrity and honor off the field as well as on he dedicated himself, first and foremost, to God. Your faith can strengthen you, and like Brandon you can choose to be a role model on and off the field. Help others: Brandon Burlsworth was a giver. He didn’t just play football, or live his life, focused exclusively on his wants. He made others needs a top priority–family, team mates, friends and fans. As he dug in deep to reach his potential as an athlete and a man, he encouraged and supported those who were taking that same journey alongside him. Brandon didn’t just make himself better; he made others better, too, because he was intentional about finding ways to help them. I hope you enjoy GREATER and are as inspired by Brandon’s story as much as I and so many others who knew him and know of him have been. He was a remarkable young man, and having the privilege of bringing his life to the big screen was a remarkable experience.